Improve hemodynamic and metabolism, increase oxygen carrying capacity & reduce deformability of red blood cells, rhinitis and wound healing. Lower blood pressure, viscosity, fat & blood glucose level. Prevent cardiovascular, cerebrovascular diseases, stroke & sudden death. Relieve pain / tension: cervical spondylosis, lumbar disc of herniation, frozen shoulder, arthritis and prostatitis. 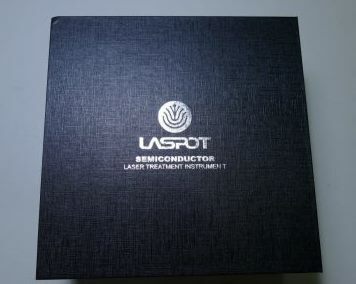 Laser watch, is also called laser therapy watch, cold laser therapy watch, or laser watch therapy: The Laspot Laser Watch is an innovative 3-in-1 Low Level Laser Therapy (LLLT) Device and it is a medical treatment device that uses the latest technology in the field of Low Level (Cold) Lasers or Light-Emitting Diodes (LEDs), cold laser therapy. This lllt laser therapy device, or called medical cold laser therapy watch, or called semiconductor laser therapy device is one of the best cold laser device for home use, and a portable cold laser technology based low level laser treatment device. Laser watch with 10 laser beams – is applied to the left wrist. Nasal Probe with 2 laser beams – is applied to the nose cavity. Pain Pad with 7 laser beams – is applied to body pain areas. Improve hemodynamic and metabolism to increase oxygen carrying capacity & reduce deformability of red blood cells, rhinitis and wound healing. Prevent cardiovascular, cerebrovascular diseases, stroke & sudden death. Relieve pain/tension: cervical spondylosis, lumbar disc of herniation, frozen shoulder, arthritis and prostatitis. What is cold laser? what is cold laser therapy? what is low level laser therapy? what is cold laser therapy used for? what is cold laser treatment? What are the benefits of cold laser therapy or cold laser benefits? 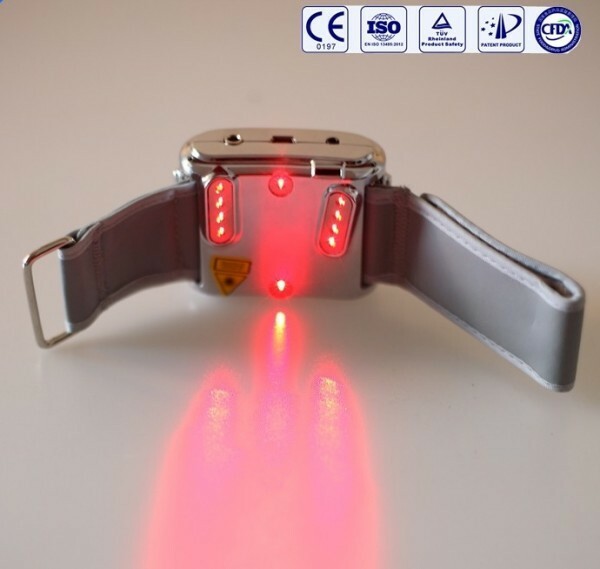 Therapeutic Principle of Laser Watch: Low level laser therapy , also called cold laser therapy watch, is based on the process of light absorption into the cells, this stimulates protein synthesis, improves metabolism, produces more lipoprotein lipase, the lipase will decompose the fat garbage in the blood, improve the red blood cell carrying more oxygen, and purify the blood , so that the blood fat and total cholesterol reduced and the insulin secretion back to normal level. 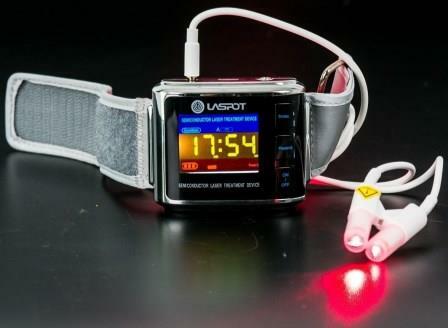 This Laser Watch (including the accessories: laser pad & nasal probe) is equipped with 19 red laser diodes. The Laser watch red laser is well known for its ability to enhance cell activity, microcirculation and activation of the immune system by simulating leukocyte groups. It increases the activity of fibroblasts, thus optimises would healing. Activating different enzymes and decomposing redundant fat in the blood stream. Increasing oxygen amount in the blood, boosting metabolism and enhancing the lipid peroxidation process to reduce cholesterol in the vessels. 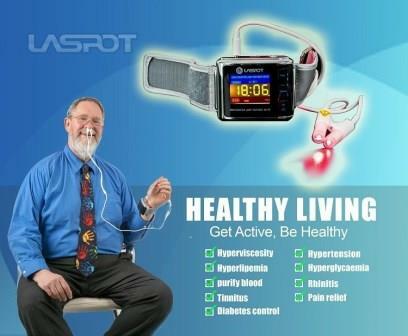 This cold laser therapy watch, laser watch is an innovative alternative treatment device to help you lower blood pressure, fight diabetes, and regain health through enhancing hemodynamics and metabolism. After 30 minutes’ usage: Through the microscope, it was observed that the red cells were activated and became clean and single, changing the viscosity of the blood to normal. After 1 to 3 months’ usage: Headache, dizziness, chest tightness, shortness of breath, palpitations, drowsiness, insomnia, numbness, memory loss and other symptoms have improved or disappeared. After 3 months’ usage: User showed improvement and/or changes in blood flow, blood tests, blood viscosity, cholesterol, triglyceride, low density lipoprotein and other indicators returning to normal. After 6 months and long-term usage: In some cases, it can effectively improve diabetic conditions, such as type 2 Diabetes, effectively balance pancreas function. Long-term application helps protect user from cardiovascular, cerebrovascular, stroke, sudden death and hemiplegia. It is a certified medical device, with certification of conformity. It is very easy to use, and there is no any side effects if use correctly as per the instruction. It is easy to carry around, can be used anywhere if you like. It will automatically turn off at the end of the treatment cycle, normally 30 minutes of use. It has strong battery, the battery can last for a few days of usage without charging. How to use the laser watch? Find the exact location on your left hand by following the guide given in above video. Wear the laser watch on your left hand, turn on the laser watch power and start the session of cold laser therapy treatment, normally 30 minutes per session. If you see the red laser lights at the bottom of laser watch, that means the cold laser therapy treatment is on. The pain relief pad is for you to connect with the laser watch and put the pad on the pain area of your body for pain relief. The Nasal Probe is for you to connect to the laser watch to insert and clip into your nose so that to help blood circulation and blood purification of your brain. 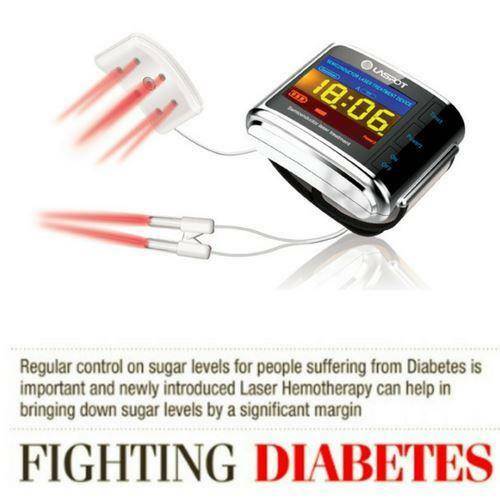 You will be able to see the health conditions improvement such as reduced blood sugar level and blood pressure in a few months of time or shorter, depending on the user’s health conditions, the more frequent using of laser watch, the better effects you will get. 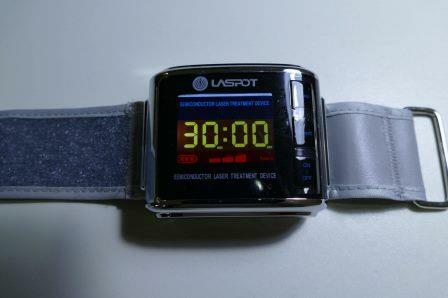 If you have any difficulty in using the laser watch, please do not hesitate to contact us. Fast delivery , 4 days after placing my order, quality looks good. After using, I realized that the battery last for a few days, I often feel warm after 30 minutes session of wearing, will keep on wearing it everyday… according to doctor, this device can help lower blood pressure & sugar. Me too, bought one at this CNY promotion period, great piece! Lucky, I bought this cold laser therapy watch during the so-called CNY promotion, much cheaper than the one sold in my country. I received it within 7 days, fast delivery, Recommend and Like it! Amazing Laser Watch and Laser technology. 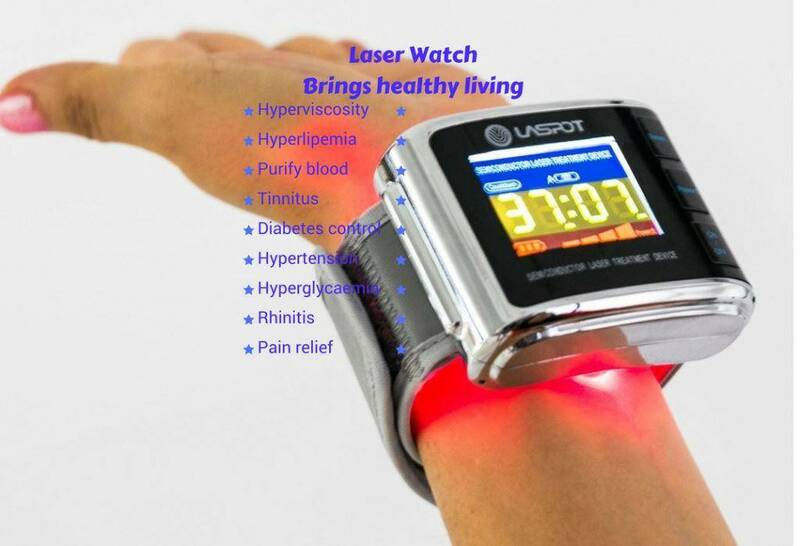 I bought this Laser Watch a few days again as per my friend’s recommendation, I have slightly diabetes, I need to control sugar level in my blood, and the kinds of food I take in, I am an office clerk, I do not have enough time for exercise and I hate to take medicines. This Laser watch seems a great tools for me to help me enhance my blood circulation, lower down my blood sugar level and help me purify my blood. Thanks for my friend’s recommendation.